Includes all the modern counties of Wales, plus the principal towns and transport network. Includes all the modern counties of Scotland, plus the principal towns and transport network. Shows all the counties of England, plus the principal towns and transport network. 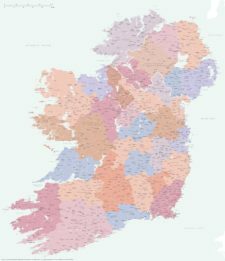 Approximately 1,400 towns and villages, 17,000+ roads, and a huge wealth of coastal detail, rivers, urban backdrop and green areas are plotted on our most detailed map of Ireland.